IN THIS DAY of virtual realities, of Xboxes and Wiis, it may be hard to imagine an entire generation mesmerized by a white dot moving across an otherwise black TV screen. But millions of Americans played Combat and Breakout on their televisions for hours in the 1970s and '80s, consumed by the magic contained within a rectangular, wood-grained box known as the Atari. This was the golden age of video games - they erupted everywhere in the culture, in hit pop songs and Hollywood movies. And in this era, the Atari was king. Introduced in 1977, officially called the Atari VCS (for video computer system), it went on to sell more than 30 million consoles. Two joysticks at a time, Atari invented a market that it would dominate until the mid-1980s, until a series of poorly received games and its technological limitations cleared the way for the more dynamic Nintendo. But the Atari has not been forgotten. Home-brew game designers still introduce new cartridges for the original console and sell them at AtariAge.com. Original rare game cartridges go for considerable money on eBay. And at universities, academics have turned their attention to the Atari, studying the revolution sparked by a group of engineers in Sunnyvale, Calif. Socially, the Atari defined the way we played video games, pulling kids from the arcade into the basement. The Atari console set the parameters of what video games would become. Despite having just 4 kilobites of memory to work with, programmers created a series of firsts, from the hidden Easter egg "clue" in Adventure to the imagination-stretching universes found beyond the TV screen on Pitfall! Nick Montfort, 36, still has an Atari. Actually, the MIT assistant professor of digital media has two in his office. 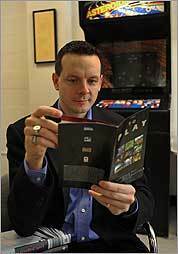 His longtime study of the world's first widespread gaming system has led to "Racing the Beam," co-authored with Georgia Institute of Technology associate professor Ian Bogost. In the book, they analyze the platforms, or systems that underlie the computing. But they also write about the social and cultural implications of the system that dominated the video game market like no other. Ideas interviewed Montfort by phone at his home in Amherst. IDEAS: It might be hard for kids raised on Playstation 3 to realize how revolutionary Pong and Combat were. Those games are also connected to what we play today, aren't they? MONTFORT: Take the Wii, for example. There are things about that system that are quite connected to the experience of Pong. Wii Sports, for instance, is a game like Pong in that it sort of shows off the basic things the system is capable of doing. How the controllers work. How people can play together. There are some differences. You can play Wii Sports with one player. But that game is a type in that it's bundled with the system and [offers the] idea that people are going to play together. IDEAS: We live now in a world where people often are sitting alone in a room playing something. Very different from the Atari philosophy, which, to me, was about games as a social experience. The games were always better with two players. MONTFORT: I wouldn't want to argue that the Atari way was better. But it has a different concept of how people will play together. Maybe we forgot some things that were good about play experience. Maybe we want the computer to be a device that is more like a hearth that members of the family come around and use to interact with each other. IDEAS: Do you have a favorite game? MONTFORT: Yars' Revenge is very compelling. It just doesn't look like anything else. It doesn't even look like other Atari games. And it has this visual and sonic and play aesthetic that's very interesting. IDEAS: What's the biggest Atari stinker? MONTFORT: Certainly the most reviled game of all of Atari history is E.T. IDEAS: I don't even remember that game. MONTFORT: You had to wiggle a joystick to levitate out of pits in a somewhat annoying way. IDEAS: Some blame the 1982 Atari version of Pac-Man for the eventual fall of Atari. Why was that game so bad? MONTFORT: You can look at the game play experience and the sound. But because it was very hard to produce a score display with more than six digits, the Atari version of that game was very low scoring, so you would play and think you were doing well and you'd get killed and say, "What's this? 131 points?" IDEAS: Pac-Man was rushed, though, because America was so crazy about that game. If Atari had taken more time, wouldn't it have had a better chance? MONTFORT: As it turned out, you can see Nukey Shay has done this version of Pac-Man and dressed it up to look much more like the arcade game. It's not that it couldn't be done with the technology, but everything is always developed under these circumstances. "We need it in five weeks and need to get it ready for Christmas." IDEAS: People like Shay are still creating 2600 cartridges? MONTFORT: At this point, it's sort of more like zines as opposed to commercial book publishing. It's on a different scale. IDEAS: Why would they, with all the modern systems available? MONTFORT: Why does somebody write a sonnet? I think it's in part because they want to connect to the whole tradition of the sonnet that is different than writing a poem of a different form. They're interested in the sonnet because they're interested in what it is as a form. IDEAS: What bigger influence did the Atari have on how we play? MONTFORT: When the system was made in 1977, it is a concept of how people will play using a computer or a television. Part of the concept is that there will be two players, because it comes with two different controllers for two players. These two players may be different in abilities or ages. So there are difficulty switches set for A and B. It's not just a hunk of metal or a thing with a wood-grain finish. It's actually a concept of how we're going to use the computer to play. Geoff Edgers is a member of the Globe staff. (David L. Ryan/Globe Staff) "Maybe we forgot some things that were good about play experience."